Despite a statewide ban, wheat stubble was found burning at a military farm land facing the GT Road at PAP Chowk here this afternoon. Lieut-Gen Noble Thamburaj today took charge as the new General Officer Commanding of Vajra Corps. Two separate bus accidents left as many as 26 persons injured in the region today. A near complete bandh was witnessed in the town today on a call given by various political parties in protest against the massacre of 35 Hindus in Doda and Udhampur districts in Jammu and Kashmir on Sunday. Campaigning for the Assembly polls in the region was virtually kicked off by the Congress party yesterday after senior party leader Sukhpal Singh Khaira, in the presence of Minister for Rural Development, Panchayats, Irrigation and Power Lal Singh, challenged the sitting MLA Bibi Jagir Kaur to contest elections on the issue of development in the constituency. After the wheat was harvested some weeks back, the stubble was today set afire by labourers working in the farm. 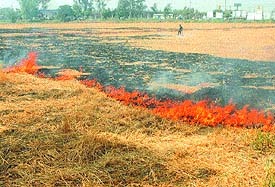 Instead of ploughing the straw in the field and allowing it to get decomposed in the soil, the labourers chose to burn it, in the process killing numerous farmer-friendly organisms in the soil and destroying the nutrient contents in the stubble. This quick method of preparing the soil for the next crop is often used by the farmers across the state despite a ban and directions of the Punjab Agricultural University against the practice. But such cases are seldom reported in military areas where the officials are rather strict about any method leading to environmental degradation. But today, stubble was being burnt hardly 100 meters away from the fencing along the GT Road at PAP Chowk in the military farm land. The land is less than 500 meters away from the boundary wall of Border Security Force (BSF) headquarters. Interestingly, an army jawan standing on a watch tower nearby also did not intervene and ask the labourers to put out the fire. The army officials said the practise was not allowed and the labourers had been told to plough the straw into the soil. The labourers were later seen putting out the fire and watering the area for restoration of the land. The Sub Area Commander, Brigadier B.B. Patil, when contacted, said he was not aware of any such incident. When he was told about the exact location where stubble was being burnt, he said he would look into the matter. General Thamburaj has a career spanning 36 years in the army. A paratrooper, he commanded a Rashtriya Rifles Sector during Operation Vijay and an infantry division during Operation Parakram. He has also had varied experiences of being an instructor in the Officers’ Training Academy, Chennai, and Defence Services Staff College, Wellington. The General had taken part in the Indo-Pak War of 1971 and counter-insurgency operations in the north-east and Jammu and Kashmir. The outgoing Corps Commander Lieut-Gen Mandhata Singh has been posted to headquarters, Integrated Defence Staff, as Director General. He had joined Vajra Corps in May last year. In the first incident, a bus from Delhi on its way to Jammu overturned after hitting a road divider on the GT Road near Beas village injuring 14 passengers. As per the SHO, Adampur, Harbhajan Singh, the vehicle, carrying over 50 passengers, escaped a complete overturn due to the eucalyptus trees on the roadside. He claimed that the incident occurred because the bus driver, Monu, was feeling sleepy. The injured were admitted to the government hospital at Kala Bakra and 10 persons were sent back after administration of first aid. Those still admitted were out of danger, the SHO said. He added that no case had yet been registered. In the other incident, 12 persons were injured, some of them seriously, when a mini-bus they were travelling in overturned near Budhu Pinder village near Kapurthala this morning. The bus was going to Jalandhar from Authla village. According to the police, the driver, Harnek Singh, lost control over the vehicle as he was talking on mobile. The bus skidded and turned turtle, the police added. All the injured were admitted in different hospitals in Jalandhar and were stated to be out of danger. All shops and business establishments were closed in response to the call given by Shiv Sena (Bal Thakeray), Shiv Sena (Hindustan), Bajrang Dal, Hindu Vikas Parishad and some other political parties including BJP and SAD (Badal). Party workers were seen demanding shopkeepers to close down shops in the bylanes of the town. Protesters also held a march that began from Gandhi Chowk and passed through the main bazaar this afternoon. They were raising slogans against the terrorist outfit Lashkar-e-Toiba who had claimed responsibility for the attack in Kashmir. A rally was also staged at Gol Chowk where speakers from various political organisations expressed their resentment against the massacre. An effigy of Lashkar-e-Toiba was also brunt at Gol Chowk. Official sources said no untoward incident was reported in the town or its outskirts. Police personnel were deployed in many areas to maintain law and order. Taking no chances, the Delhi-Lahore bus, which passes through Phagwara, was diverted through Nurmahal, Phagwara ASP Sukhchain Singh Gill said. The minister was here to lay the foundation stone for the construction of studs and spurs in Beas near Butala village. Using the occasion, Mr Khaira claimed that he had initiated as many developmental works in the area as Bibi Jagir Kaur. Talking to mediapersons later, Mr Lal Singh said that 12,500 villages in the state would start getting a 24 hour power supply soon.